You can play games on your PC, Xbox or on smartphones like the iPhone. However, the game controllers are different for each of these platforms. Due to this, many third parties offer accessories such as game controls in order to make it more enjoyable for users to play games on their smartphones or iPhones. Here are the top gaming accessories that you can use for transforming games on your iPhone into the most enjoyable experience. We can play various games on Mac/PC, console games like Xbox or smartphone games on the iPhone. These 3 different game worlds have different games due to different game controllers. 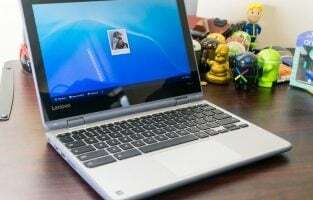 PC tends to use keyboard and mouse, the game console is using the gamepad while smartphone uses the touchscreen. Each of those game controllers has advantages and disadvantages depending on its sort. I still love to play Angry Birds game with touch game controller but I really love to play Call of Duty by using the gamepad. Because of this difference, the opportunity for third-party hardware accessories companies opened, to create gaming controller accessories for smartphones to fulfil the needs and provide the comfort in playing games on iPhone. We are going to share some of the best iPhone gaming accessories which will turn it into a game device. iPhones have come a long way and now offer excellent features for playing games. Game quality has also seen a lot of improvement in the App store. Some game developers have created unique controlling systems for games to be played on touchscreens, whereas, many others have done innovations to games normally played on the PC or on gaming consoles so that it can now be played on smartphones. These are ported games and the experience can be enhanced by using accessories and physical controllers for the iPhone. MFi is the certified controller for iPhone devices, so it’s a recommended buy. These are in the form of sticks or control pads and make games on the iPhone more fun. The company is known for offering functional accessories at reasonable prices. 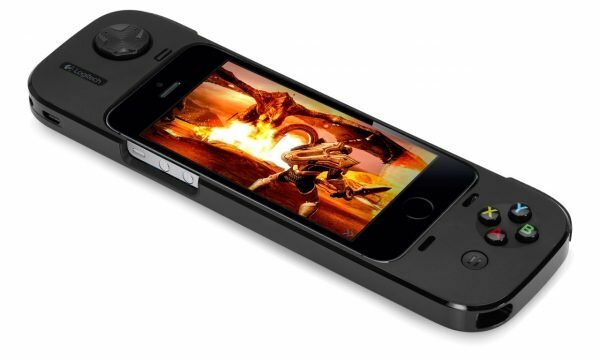 This is an iPhone game controller that can take your gaming to the next level. It is cheaper when compared to the competition, but is as expensive as an Xbox One controller. It also supports iOS 8. The design is sleek, solid and comfortable to hold in your hand. The trigger response is perfect. It is similar to the Xbox S controller. It comes in a jet black glossy look on the top and a matte finish under. The Bluetooth button works only for games, so you cannot use it for streaming a service. The joysticks are comfortable to hold. The D-Pad also feels great, but many games don’t support it, except for camera controls. 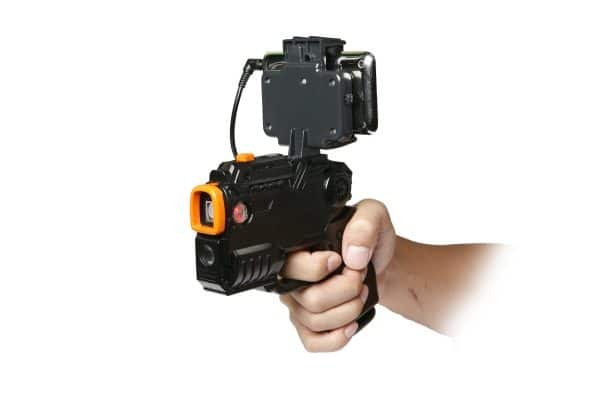 The triggers, as well as the bumpers, are excellent and the resistance is accurate. Those looking for a solid controller with fast response and the perfect size. A cheap but reliable controller for your iPhone. Suitable for those owning the iPhone 5; iPhone 5s; 6 and the iPhone 6 Plus. 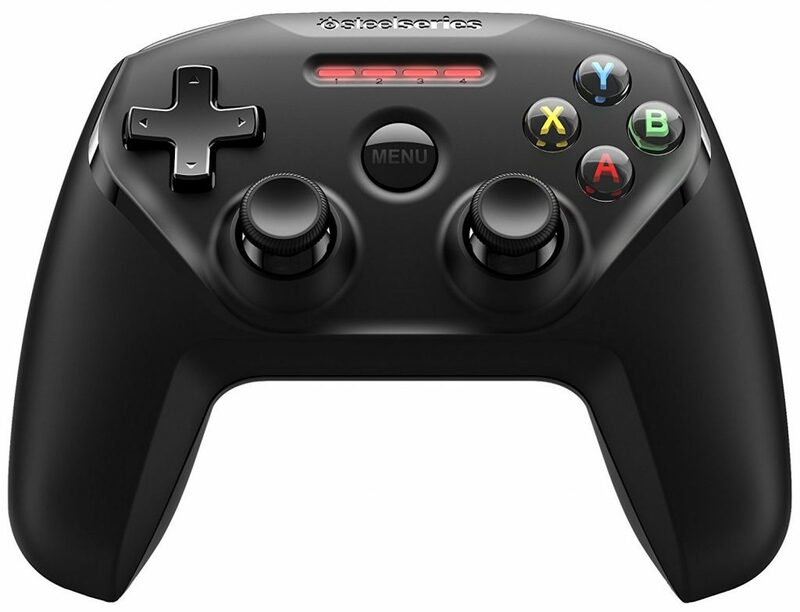 Perfect if you don’t mind a slightly heavy, big form factor and more expensive controller. It consists of a D-pad with 4-way buttons with the iPhone or the iPod Touch to be placed at the central holder. In addition to these 4 buttons, there are two other buttons on the top, which work for certain compatible games. It works on AA batteries. You just need to pair it using the Bluetooth on your iPhone and get connected to start playing. The controller is fairly heavy and does not fit in pockets. The buttons are a little cheap looking, but that’s a given in most smartphone add-ons. It is responsive, though the Bluetooth pairing is a slightly complicated process. Most games will require only the joystick and one navigation button, so it is rather unnecessary. Perfect for both landscape and portrait modes. Suitable for those looking for a solid grip on the controller. Those looking for a joystick-like experience, making action games really enjoyable. Also suitable for those who play old school type of games, so it’s not compatible with Angry Birds, though it is with Temple Run. You’ll love it if you love retro games, but not if you like the latest titles. Suitable for those looking for functionality rather than form. Whatever the game you’re playing, you can do it much better using a real wheel. This iSound Game Wheel comes with a design that can be easily snapped on. The grip is firm and rubberized allowing you to corner effectively. It has been designed to offer a realistic experience while playing a racing game. Installation is simple and easy. It is an MFi controller that makes use of Sony Dual Shock layout. It is easy to pair up. The analog sticks are excellent and the buttons are responsive. Even the triggers function smoothly. It plays games far more smoothly than the Apple TV remote. What’s more, it also comes with Apple’s approval seal, being one of the official peripherals. The D-pad is slightly big and problematic to access. There is no Lightning cable and doesn’t have a clip for your iPhone. The dimensions are 5.9 x 4.3 x 2.5 inches. It is not very hefty either. There are 2 analog sticks along with a D-pad, and also 9 buttons. All are comfortable and sensitive to touch. There aren’t too many features, however, just the basic ones. It runs on a battery that is rechargeable and not AAs but allows 40 hours of playtime. You need a Lightning cable for charging it, not the usual micro USB. You can also use the mobile app for it in case of connecting with your iPhone or the iPad. Use the mobile app for upgrading the firmware or just watch tutorials, check out compatible games and so on. Those who want to pair the controller with several iOS devices or even with their Mac. Those looking for a solid, pleasant looking and comfortable controller. Good while you’re on the go, as it allows you 40 hours of playtime. 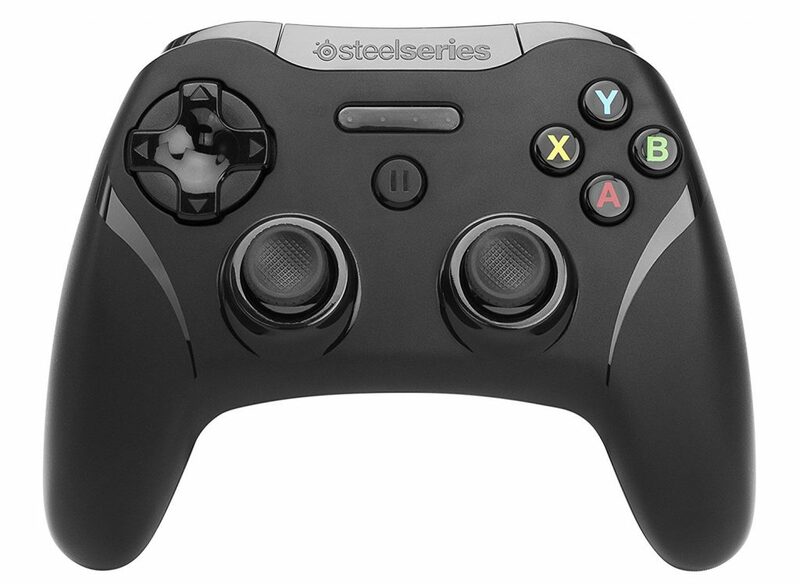 Those who want a controller that delivers all the functionalities at a reasonable price. If you want a simple device that looks great and feels great, playing games just the way it should, this is an excellent option. This is a controller that has made use of the Xbox One controller as its inspiration. It is heavy and gives a premium feel. It runs on 2 AA batteries and offers a battery life of 40 hours. 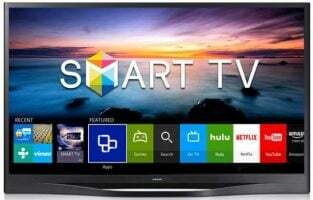 It is the follow up to the first Stratus but is bigger and also cheaper. The shape is new and it comes with extended handles. The matte finish offers a good grip. However, it does not have a clip to hold your iPhone, so you might have to purchase a stand separately. It’s easy to set up the SteelSeries Stratus XL by connecting it with your iOS device using Bluetooth. You can also connect it to a supported game even without using iOS Bluetooth. There are two analog sticks and one D-pad, along with 4 face buttons and 4 shoulder buttons. It has a good build and feels premium. It is pricey though. Those looking for an excellent controller, in terms of build, design and premium looks. Compatibility with iPhones, iPod touch and iPads. But especially suitable for iPads. It’s a strong option if you’re only interested in iPad gaming. Those who don’t mind paying a little more for a sturdy feeling controller that look as well as feels like console controllers. This VR headset offers a mobile VR experience during gaming. The headset consists of two biconvex lenses of 37 mm, offering a clear view. The FoV is not very big on phones like the iPhone 6 or 6S or even the iPhone 7. 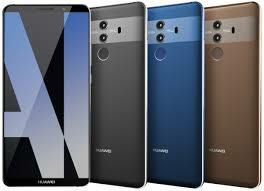 However, it offers a good immersive experience and you can use it for a prolonged period of time quite comfortably. It comes with the Google Cardboard V2, a button that is compatible with the iOS software and the button is quite effective and responsive. The lens quality is excellent, clear and doesn’t ‘t fog up, as the nose gap has been positioned accurately. It is comfortable and the face pad can be interchanged. There is an alternative faced. The head strap also can be adjusted and can fit anybody. There is a magnet on the front hatch, which is used for opening or closing the hatch. Your iPhone can be positioned quickly and efficiently with vertical centering being done automatically. The V2 also comes with some additional improvements when compared to its predecessor. For instance, the buttons function better. The facepad quality has been improved and the FOV is also improved. The IPD, as well as the focal length, can be adjusted and the case is also of a good quality. However, people wearing prescription glasses cannot make use of this accessory. 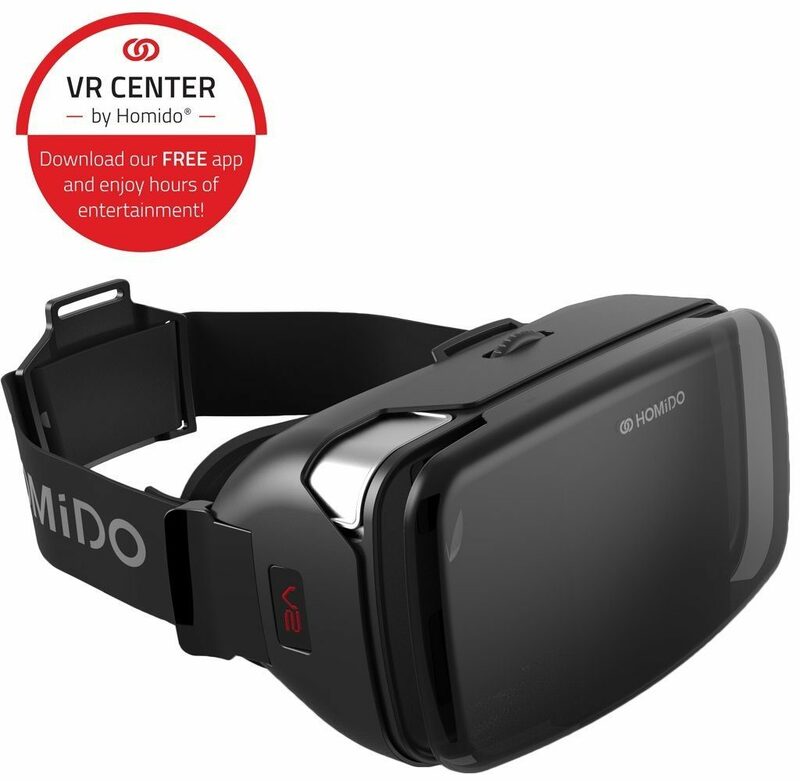 Those who are looking for a premium VR headset with full specifications. It is recommended for those using the iPhone 4.7 inches as well as the 5.5 inches models. This means that it is recommended for those owning the iPhone 6, 7, 6 Plus and 7 Plus models, all of which can be inserted in this headset. Those who are ready to pay this price for a headset with limited AR capabilities. 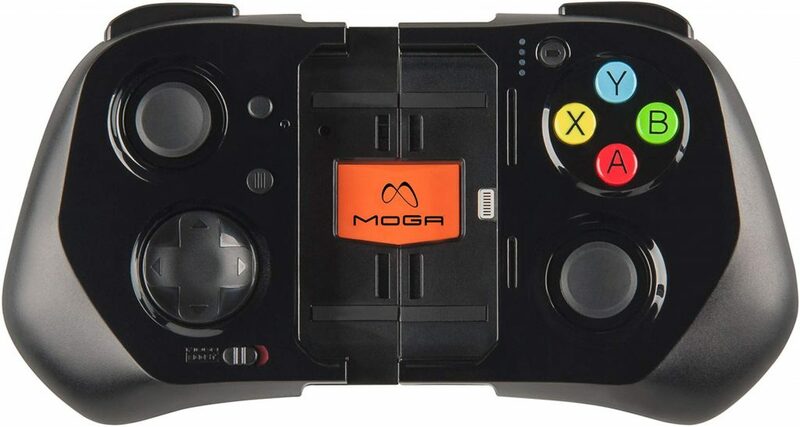 It is an MFi controller and has everything that is important for gaming. It comes with 2 triggers and 2 shoulder buttons. There are 2 analog sticks and you get extra juice when your battery runs out. There is a direction pad, a pause button and 4 face buttons. It has a plastic body and feels rather like a toy, though it is robust. 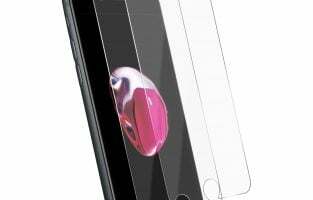 It consists of two halves that can slide and separate for putting your iPhone in. It very easily blows the competition out, with its excellent controls. The battery button shows the status of the battery to show how much juice you have left. The nubs are as good as those in the Nintendo as far as quality is concerned. Due to its large size, however, it isn’t portable. The working is simple and user-friendly. The battery lasts for 18 hours. You can use the app from App Store to find the top games that are supported by Moga Ace Power, such as Angry Birds; Call of Duty; Dead Trigger 2; Grand Theft Auto and several other titles. The controller is especially good with games that need 2 analog inputs. All the buttons necessary for modern gaming are present. The battery life is also impressive. There are also plenty of games that are supported by the controller, with many more being added. This accessory doesn’t support the older models, namely: iPhone 4, iPhone 4S, iPad and iPad Mini. Those using iPhones running on iOS 7 and above. Recommended for those using the iPhone 5s; 5c; 5; as well as the iPod Touch 5th gen. Suitable for those looking for a robust controller without any fancy textures or premium looks. Only suitable for iOS devices that have lightning connectors. It’s not only a game controller but the second battery for your iPhone. With powerful, precise console-style analog controls you will dominate your favorite iOS games easily. D-pad, shoulder triggers and button cluster move your hands away from the screen for clearest view of the action. Moreover, 1500 mAh Battery will increase your iPhone’s battery while you are playing the game. You can check the App Store frequently for the latest controller-compatible game releases such as Bastion, LEGO The Lord of the Rings, LIMBO, Sonic the Hedgehog 2, Star Wars Knights of the Old Republic, Terraria, The Wolf Among Us, Tomb Raider, Trials Xtreme 3, Scribblenauts Remix, PAC-MAN. The easy access phone features allow your iPhone’s camera, music, and calls remain fully accessible while you are gaming. 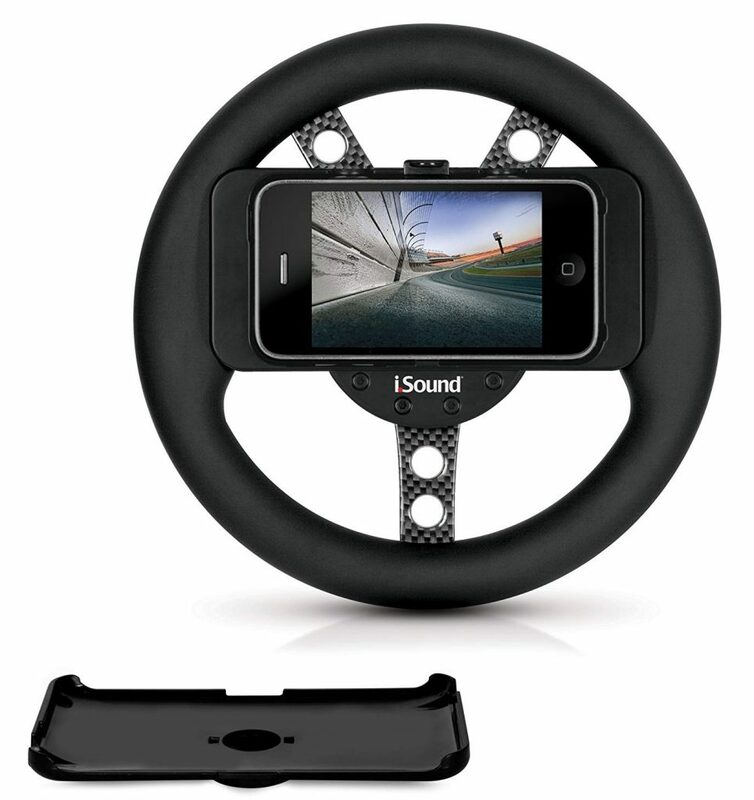 This product will maximize your experience in playing racing games app on your iPhone or iPod. 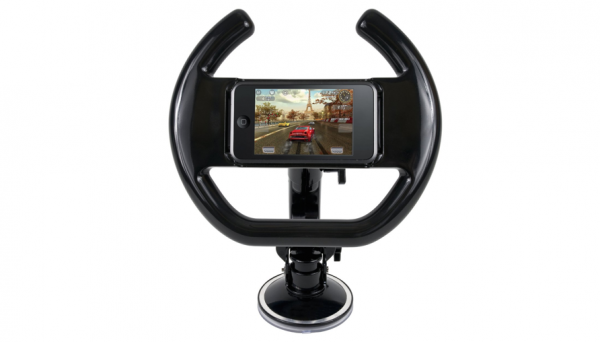 It’s designed for a racing steering wheel to give you real physical feel experience when you are playing a racing game. It comes with a steering column stand to add balance and stability: eliminating any unwanted or unnecessary motion. It’s compatible with iPhone and iPod. This product will turn your iPhone into a game boy. 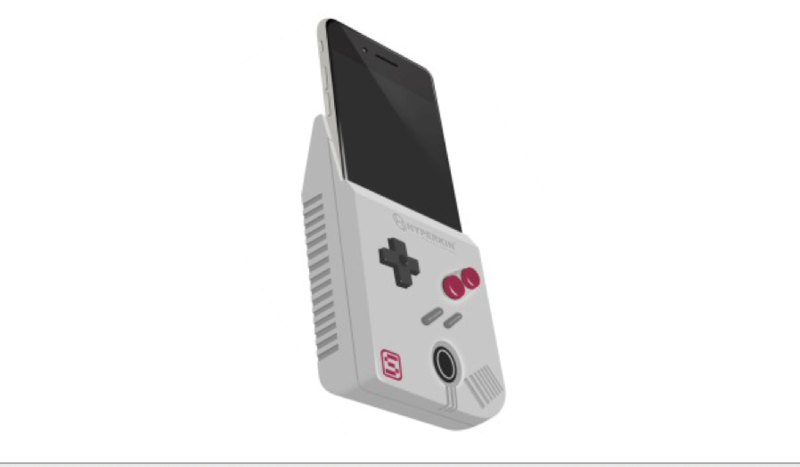 The concept is to attach the iPhone to it and turn the iPhone into a handheld gaming device compatible to a game boy. 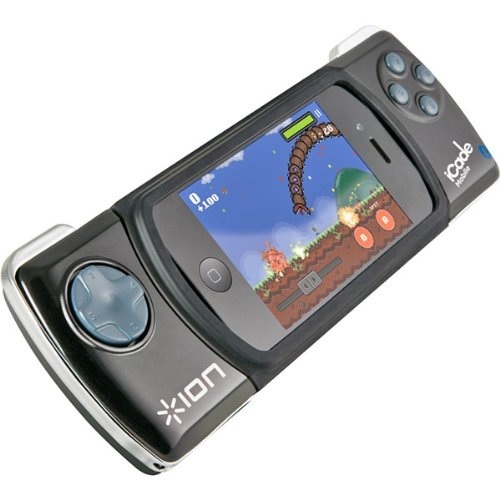 A start and select button; and an included battery that can be charged through the phone itself providing 5 hours of gameplay. iPhone is a great device that can be turned into a portable game device. 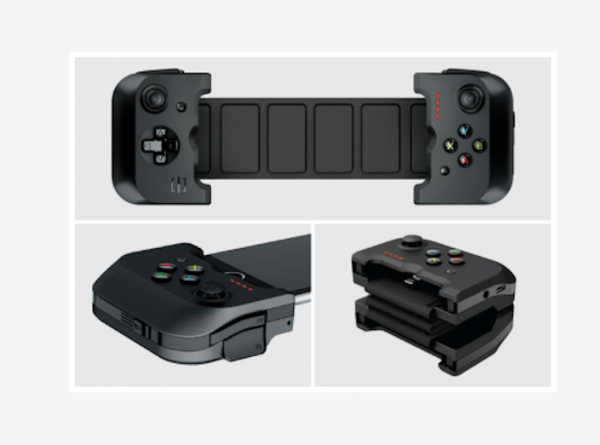 One of the best gaming controllers for iPhone is Gamevice. It has almost every requirement as a portable accessory: easy to carry, light, and small. The weight is only 0.16 Kg with 247mm x 80mm x 25mm. It has 2 analog sticks that are connected by an adjustable strap to fit with 4.7-inch iPhone 6/6s and 5.5-inch iPhone 6 Plus/Plus S and made of a quality material. The strap can be folded, so it will become smaller and easier to carry. 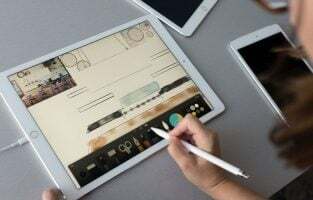 It is also provided with audio DAC, 3.5mm headphone jack, Micro USB power, and lightning connector. One of the most important things is that Gamevice for iPhone has an MFI certificate from Apple. The iOS is a gaming platform that most gamers love. It is fun to play puzzle games on your iPhone. However, action games are not much fun unless you have a good controlling accessory. The touchscreen controllers are just not enough for action games. A good old fashioned joystick offers the best experience for such games. You just have to add a few of these accessories in order to convert your iPhone into a true gaming platform. These accessories can turn your iPhone into an amazing video gaming system. So who says that serious gaming can only be done on consoles? Today, your iPhone can be bundled with accessories that enhance your gaming experience. With the help of these above-mentioned accessories, you can turn your iPhone into a perfect gaming device and make most out of it. These accessories will help you to do your favorite things in the better way and for a longer time.